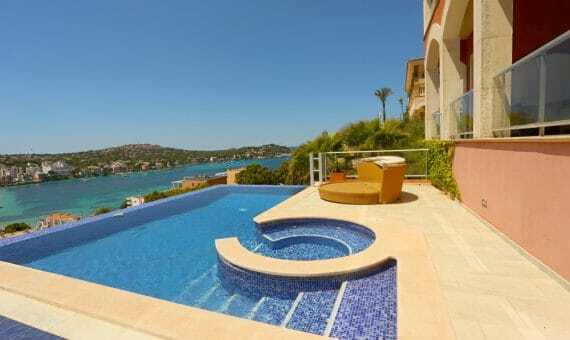 Mediterranean style villa in a peaceful sought after residential area of Santa Ponsa, in the southwest of Mallorca. The house was built on a plot of 1.300 sqm, which offers a garden with wide diversity of plants and bushed, a swimming pool surrounded by open terraces and lawn, a well, and large number of indoor and outdoor terraces offering wonderful views over the sea and surroundings. The villa with 450 sqm of living area consists from a spacious living room on two levels composed by lounge with fireplace and dining area, a separate kitchen with a dining table, 5 bedrooms, 6 bathrooms, and a laundry. On the ground floor there are an office, a garage with storage, and a big room equipped with cosy lounge with a bar, a chill-out, and an American billiard table. The house is equipped with central heating, air-conditioning, sauna, and built-in wardrobes. Plenty of decorative details as wooden ceiling beams, balustrades, wooden indoors and stone outdoors, etc. highlight Mediterranean style of the house. The property is situated on the cul-de-sac street, consisting of private houses, which guarantees absolute peace and quiet for the future owners. The center of Santa Ponsa with 2 sandy beaches, restaurants, supermarkets is located in less than 5 minutes distance is, and a luxury marina of Puerto Adriano with a shopping center, boutiques, famous restaurants, and a sandy beach can be reached in a short drive.